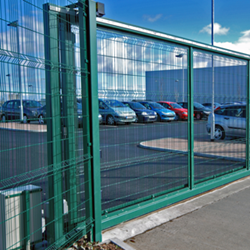 Did you know the leading reason our customers purchase a GateGuard® system is distance? 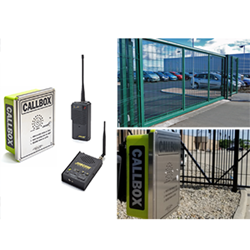 Those using this long range wireless gate intercom system enjoy the fact that they’ve overcome the challenges and restrictions faced by physical distance between the access gate and the guard house or security point. Installing our outdoor wireless intercom (the XT Radio Callbox) at the gate, wired directly to the gate controller, provides radio signal distances for security to buzz in those requesting access. Our packaged system of pre-programmed radios allows a roaming security guard (equipped with the JMX Portable Radio included in the package) to communicate with those at the gate or door, making a decision to allow access. Security staff in the guardhouse up to a mile away from the gate use the pre-programmed JBS Desktop Base Radio (a remote intercom and radio) to monitor radio traffic and grant access to those at the gate. A close second to distance is ease of installation. With OSHA enforcing the crystalline silica standard to protect workers from silica exposure, cutting through concrete and asphalt carries new costly overhead. That makes a wireless, no trenching solution even more attractive. With range of up to one mile line-of-sight with no obstructions, options for installation are highly flexible. We’ll be at FENCETECH 2019 in Indianapolis March 13-16. This show brings together the fence and access control industry’s leading manufacturers, distributors, contractors and specifiers under one roof. Look for our ad in the February issue of World Fence News, and look for Ritron staff showcasing the GateGuard package in Booth #1675 at the Indianapolis Convention Center. Purchase Ritron products through our network of authorized reseller partners across the United States. Send us an email at sales_info@ritron.com or call us at 800.872.1872 and we'll connect you with a trusted partner. Click here to schedule a consultation with one of our account managers or to be connected to our dealer network.